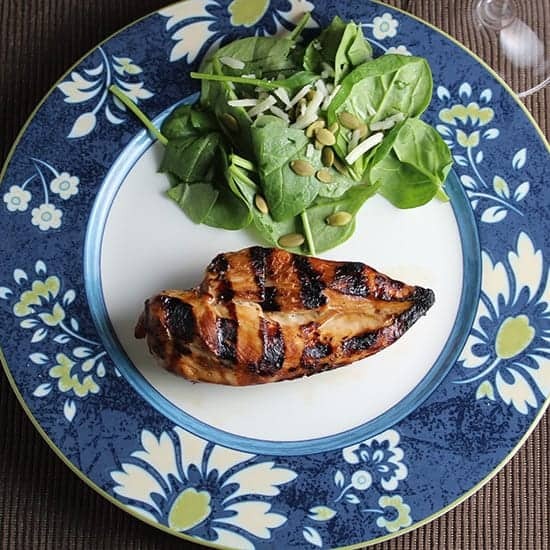 This recipe for Juicy Grilled Chicken Breasts is definitely a go to option for us when the weather (finally) turns to grilling season! We made it again recently and served it with a great wine pairing, a Pinot Blanc from Alsace, motivation to come back and update this article…though we haven’t had a chance to swap out the photo with the red wine pairing yet! Disclosure: The Pinot Blanc was a complimentary sample from Teuwen Communications as part of the #AlsaceRocks event are doing with the French Winophiles…more details on that coming very soon! Throwing chicken breasts on the grill is an easy way to feature lean protein as part of your summer meals. But how to grill that chicken so that it comes out nice and juicy? We experimented with a few tweaks to our method to bring you our family’s consensus favorite, presented to you today in this Juicy Grilled Chicken Breasts recipe. This recipe is for boneless, skinless chicken breasts. I like to buy them as fillets (basically the breast cut in half by the butcher) as it cooks up quickly. If you’re looking to grill bone-in chicken breasts, you’ve got to check out our Simply Scrumptious Grilled Chicken Breasts with Garlic Basil Butter. The method is pretty different to get moist bone-in grilled chicken, but the result in both cases is juicy grilled chicken your family will love. In addition to aiming for juicy chicken, our goal in this recipe was chicken that is flavorful but straightforward, something our nine year old would enjoy for dinner and in sandwiches for lunch the next day. In other words, we wanted enough taste to please the grownups, but it couldn’t be too spicy or adorned with a fancy sauce. A marinade with some salt is one good step toward juicy grilled chicken. I like to use soy sauce to provide the salty element in many of my marinades, and used that approach for this recipe. The first version of this grilled chicken was tasty but a bit on the salty side. For the final version, I cut down on the marinade time and the amount of soy sauce. One hour to marinade the chicken means you can get home from work, get the chicken marinading while you make a salad and take care of a few other things. I usually like some kind of citrus in a marinade. In today’s recipe, that citrus was provided by lemonade…not something I’d done before, but we all liked the taste! A good marinade is the first step toward juicy grilled chicken, but you’ve got to avoid overcooking it on the grill, too. Grilling the chicken covered on medium high, flip the chicken after just five minutes, then check for doneness after 5 to 6 minutes. The chicken should be white throughout but still nice and juicy. Unless you’ve got a particularly thick piece of chicken, 10 to 12 minutes of grilling time should do the trick. Sit down, and enjoy your chicken with a green salad and perhaps a grain like couscous or quinoa. You can go a number of ways with the wine for this one. I will start with a recent pairing for grilled chicken that worked out very nicely. I had the pleasure of receiving 4 different types of white wine from Alsace as part of the #AlsaceRocks event we are doing with Teuwen Communications and the French Winophiles. 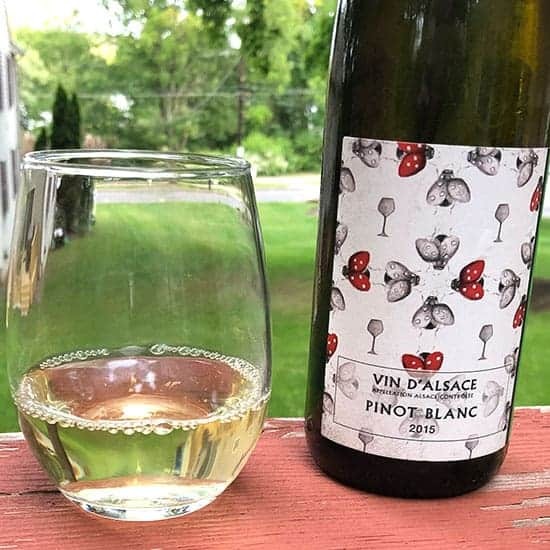 The warm weather and food friendly nature of the white wines from Alsace quickly had me down to one bottle left to try, the 2015 Ribeauvillé Pinot Blanc ($18, 12.5% ABV). Pinot Blanc is recommended as an aperitif or to pair with fish or poultry dishes. I was planning to served up our juicy grilled chicken breasts the other night, and I figured it was a good time to open up the Ribeauvillé Pinot Blanc. I was not disappointed! The Ribeauvillé Pinot Blanc floral nose. On the palate: lemon, stone, and a bit of honey. Medium bodied and nice mouthfeel. Definitely pairs up very nicely with our juicy grilled chicken! La Cave de Ribeauvillé is the oldest wine co-op in France and a highly regarded Alsace producer. The co-op has an interesting quality control charter, with 100% parcel traceability and organic / sustainable farming methods. La Cave de Ribeauvillé produces all 7 classic Alsace wine varieties. 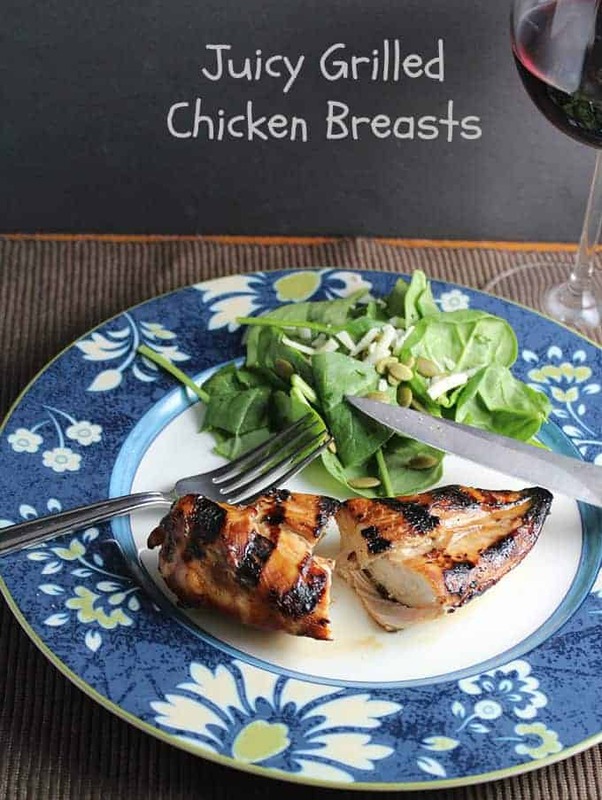 The Pinot Blanc from Alsace is definitely a great wine pairing option for this grilled chicken recipe. A restrained Chardonnay is another white wine option here. We have also enjoyed this chicken with Pinot Noir. 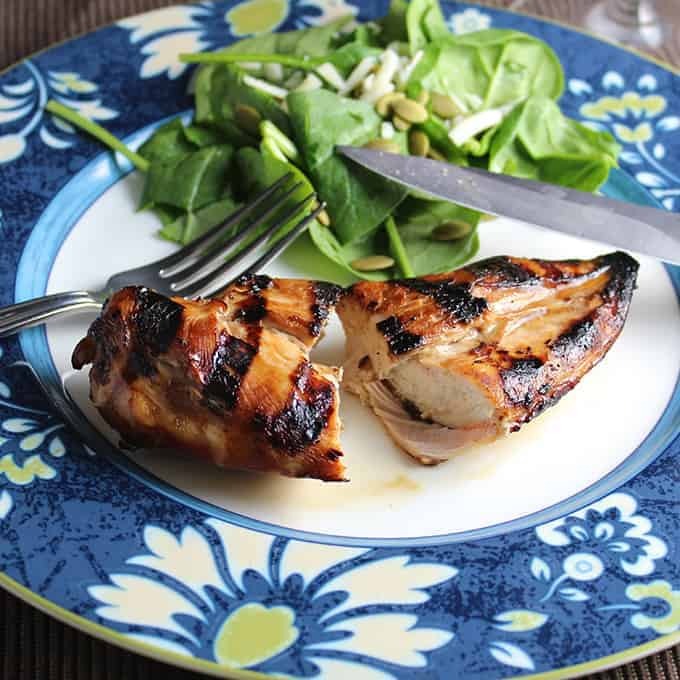 A simple marinade help make these juicy grilled chicken breasts a tasty main dish. Make the marinade: combine the soy sauce, lemonade, vinegar, olive oil and honey in a small ball. Rinse and pat dry the chicken breasts. Place the chicken in a sealable plastic bag, then pour in the marinade. Seal the bag, and toss gently to get the chicken well-coated. Put the bag with the chicken into the refrigerator to marinade for one hour. When you are ready to grill the chicken, preheat a grill to medium high. Spray some cooking oil onto the grill. Take the chicken out of the fridge. Shake the excess marinade off the chicken, then place on the grill. Repeat for each of the pieces of chicken. Reserve the extra marinade. Grill covered for 5 minutes, then turn the chicken over. Spread a teaspoon or so of the reserved marinade on each piece of chicken. Grill covered for another 5 to 6 minutes. Check for doneness, and remove from the grilled when just cooked through. This time should be good for a small to medium piece of chicken, larger breasts may need a bit more time. We have successfully swapped in orange juice and even Gatorade for the lemonade with good results. This looks like a great go-to marinade. I love how juicy it looks like it keeps the chicken. Great flavors! I’m loving the lemonade in the chicken marinade – I’ll have to try that! it wasn’t our original plan, but what was all we had on hand to add a touch of citrus! that is about all that is needed. Thanks Catherine!